The USA (region one) version of The Rocky Horror Picture Show - The 25th Anniversary Edition on DVD Video was released on October 3rd, 2000. At present we do not have any firm news of a UK (region two) release date, but Fox are now talking about releasing the (UK) disc some time in early 2001. Hopefully this will be with similar features to the USA disc. Having said that the UK discs are only just begining to include the kind of extras that the Americans take for granted. Most collectors in the UK will be looking at getting both versions as American theatrical releases tend to have slightly alternate content to the UK versions. The USA disc has the option to watch either an American version of the film or a UK version, complete with the full version of 'Superheroes' that has appeared on all versions in the UK since 1992, when TimeWarp for our Transylvania Convention managed to get Fox to make some brand new copies of the movie with the full song included (and get it re-certificated down to a "12" for cinema release at the same time). 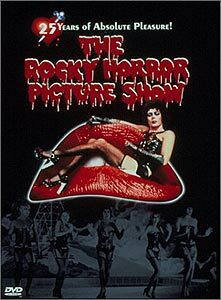 Well this is one hell of a disc set, from the packaging through to the presentation it's the best version of the Rocky Horror Picture Show that I have seen outside of a cinema. The coding is excellent, peaking at 10Mbits a second, that's about as good as it gets on DVD. The interactive menus are fun, complete with talking lips and moving legs, but do get a little annoying after a while. Along with the choice of (very well done) 5.1 channel sound, you can also select the original mono soundtrack for the movie. You can also select subtitles and a participation prompter. Other options include an audio commentary by Patricia and Richard as well as an interactive version with white lips appearing every now and again to whisk you off to a USA movie showing, with performance cast. This is one hell of a set of discs, buy one now!!!! Note that this disc is region one and will not play in an unmodified UK player, the Hollywood Movie Studios insisted that the world was divided into six regions to allow stagered release dates/alternative program content/etc. (eight regions if you count aircraft and the reserved code) Here in the UK we use region two coding, in America and Cananda they use region one. Most UK players are adaptable to multi-region, allowing you to play any discs from around the world, and modifying players or importing discs for your own use is not illegal, providing the discs don't contravene any obsenity laws! I don't know anyone who hasn't had their player modified. Check out some of the major home cinema magazines for more details, my fav's are Home Cinema Choice and Home Entertainment. In the USA they don't tend to modify their players for multi region, but as more and more UK only discs become available that may change. The disc is rated "R" in the USA, which means "Not for sale to persons under age 18", the UK disc should be a 15 certificate as was the last release of the UK video and Laser Disc. Easter Egg time! Yep, those of you who know about DVD's will know that it has become a bit of a tradition to add a 'Secret Feature' or two, commonly know as 'Easter Eggs' because you have to hunt for them. Well Rocky get's one too and this is what you need to do to see it in action. Do the usual selection of version (UK or USA), then the audio you want, if required. Next go to the scene selection but don't choose a scene, instead click to the left of the screen and a pair of Lips will appear. Click on the Lips to see the original idea for Rocky with the start of the movie in Black and White. In my copy of the original shooting script for RHPS the movie was intended to start in Black and White and continue this way up to Frank's entrance. Frank's red lips were then meant to be the only colour in the film until he throws his cape off, at which stage the movie bursts into colour. The DVD jumps to colour as Brad and Janet enter the Time Warp room, so it's still not quite as intended, but hey, four out of five for effort. You can order the disc direct from Amazon.com in the USA. I have used Amazon quite often to import DVD's and have always found their service to be very good indeed. Pay on a credit card via their secure server and the card company will convert the dollars into pounds on your bill. At time of writing they were offering the disc at $19.98, plus postage and packing. That is 33% off the suggested selling price in the USA. Even with postage and packing you are looking at paying not much more than fifteen pounds for the disc.